To be honest, the first time I ever saw Fable Legends – Lionhead’s 4v1 multiplayer remix of Fable, due out later this year – I could have made a confident educated guess that it would be free to play. Its reliance on team play and selection of different, customisable heroes suggested a splash of LoL and DOTA might have found its way into the design document. The developer has now officially confirmed it, shortly after announcing that players on PC can join Xbox One owners in the same matches. For fans already thrown by the idea of multiplayer-only Fable, this might not seem like the most reassuring news, but it certainly appears that Lionhead aspires to the Valve model of free-to-play as opposed to, say, the Candy Crush model – or, worse, the increasingly prevalent “paymium” model, where a developer asks for £45/$60 up-front and then also tries to tempt you into micro-payments. This inspires confidence, at least in me. The game itself, which was already promisingly fun when I played it last year, is a convincing action-orientated arena combat experience when you’re playing as one of the team of four heroes and a reactive strategy game when you take on the role of the villain, placing enemies for them to slaughter (or succumb to). With ten heroes now in place it’s got a robust selection of playstyle options. The combat was never the best thing about Fable – not by a mile – but Legends’ fighting spans a variety of third-person action styles: playing a ranged character, it feels like a Gears-style third-person shooter, whereas some of the sword-wielders have a touch of Devil May Cry flavour. Here’s how things will work: any PC or Xbox One player will be able to download the game for free. There will be a whole story’s worth of quests at launch, with more to be released episodic-style every few months, and continuous updates. There will be no paywalls, no limited game time, no horrible “energy bars” or “gems” or whatever that take time to recharge. There will be 4 heroes available to play at any one time, and they will rotate every 2 weeks. Then, if you want to keep playing a character, you can either wait for them to come back into rotation (with all your XP and equipment intact), or pay to unlock them permanently. You can pay either with earned in-game money or real money, and you can also pay for cosmetic items; everything gameplay-related can only be earned through play. Same goes for villain players: different villain monsters will rotate every few weeks, and you can pay to unlock them permanently. To that end, Fable Legends has no solid launch date beyond “2015,” and is unlikely to get one until much nearer the end of the year. That way, Lionhead can gradually open up the (currently closed) beta to more and more people and launch when there’s confidence that everything is working at scale. 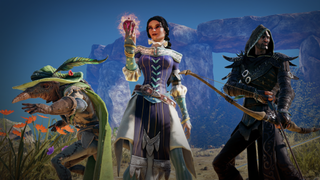 It’s never going to be a 100 per cent sure thing, but the studio is giving itself ample time to ramp up Fable Legends gradually. Multiplayer-only Fable will always be a tough sell for some, but the game’s fun, crucially, the fairytale Fable feel is definitely there, and the barrier to entry is low, so anyone can try it out (and then walk away with wallet intact if it doesn’t appeal). Free-to-play actually seems less risky to me than asking people to pay £45/$60 for a multiplayer-focused take on a series that’s got such strong single-player memories attached to it. The beta is likely to expand its player population in the coming months. If you’re curious, you can sign up here.